In today’s fast-paced world where distractions are plenty, it has become important for companies to not just maintain customer relations but also nurture them. Your customers should feel special and cared for. Delivering messages with business sense is essential but it does not go long way in ensuring customer loyalty. Customer Relationship Management serves as the connecting link between your organization and customers. 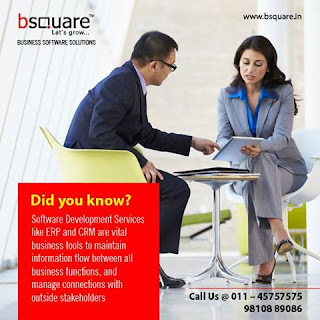 Bsquare is among one of the leading CRM software companies and offers Customer Relationship Management (CRM) software solutions in India. Cloud CRM Software is a comprehensive solution that compiles and maintains customer data efficiently by capturing all pre-sale and post-sale force interactions of the customer. The information is compiled through a number of channels or points of contact between the customer and the company. The points of contact could include a number of platforms such as the company's website, telephone, live chat, direct mail, marketing materials and social media. CRM software helps in maintaining regular touch with customers by streamlining all major areas of customer interactions. The software works by making use of a dashboard, analytics and reporting tools to provide business owners with a central database. With access to a vast stockpile of data, business owners can control customer engagement by spotting patterns and identifying trends. As you can track prospect activity, you can reach out to them when the time is right and follow-up accordingly. So if you have been looking for a quality CRM software provider, choose Bsquare! By making your customers a priority you give them a reason to come back and spread good word about your services and your company.